Here’s a look at this display, found on top of the camera. You can illuminate the panel temporarily by rotating the On/Off switch past the On position to the light bulb marker and then releasing the switch. Depending on your eyesight, making out the tiny type on the Control panel can be difficult. 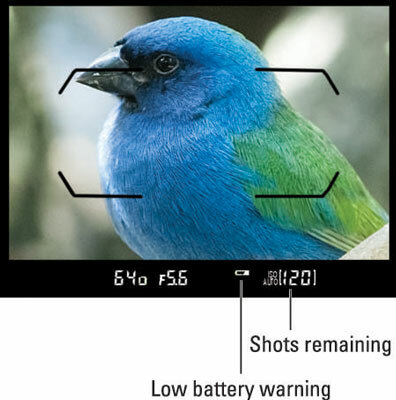 Fortunately, you can press the Info button on the back of the camera to display the Information screen on the monitor. 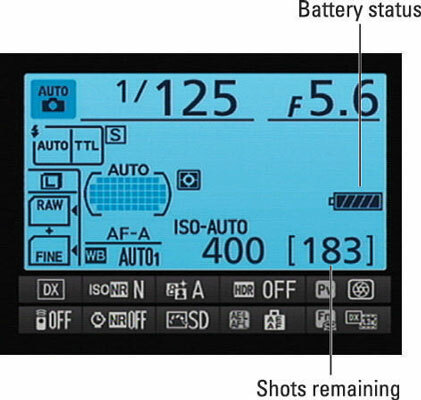 This screen displays the current shooting settings at a size that’s easier on the eyes. The Information screen has a hidden power, too: After the screen is displayed, you can press the i button to activate the control strip at the bottom of the screen. You then can quickly adjust any of the settings on the two rows of the strip. Use the Multi Selector to highlight a setting — a little tooltip (text label) appears to identify it — and then press OK. The camera then zips you directly to the menu containing the available settings. Make your choice and press OK again to exit the menu. You then can adjust another setting or press the i button one more time to deactivate the control strip. Press the shutter button halfway to return to shooting mode. You can view some settings in the viewfinder as well.